The pilot/builder was carrying out the initial flight test after recently building the amateur experimental airplane. Shortly after takeoff, the airplane's engine experienced a total power loss and the pilot initiated a descending left turn in order to avoid an airport fence. Subsequently, the airplane impacted terrain, in a nose down attitude with the left wing low. An examination of the engine revealed that the Force One Main Bearing seized to the crankshaft. Further, there were multiple circular impressions on the bearing surface. Based on this evidence, it is likely that while building the experimental engine, the pilot did not properly align the Force One Main Bearing, and the oil feed hole was inadvertently used as the dowel pin hole, which resulted in a blockage of the oil transfer hole, thus preventing oil into the bearing and resulted in engine seizure and total power loss. The pilot/builder's failure to properly align the Force One Main Bearing, which resulted in a blockage of the oil transfer hole and culminated with a total engine power loss. Contributing to the accident was the pilot's failure to arrest the bank and sink rate prior to impact. 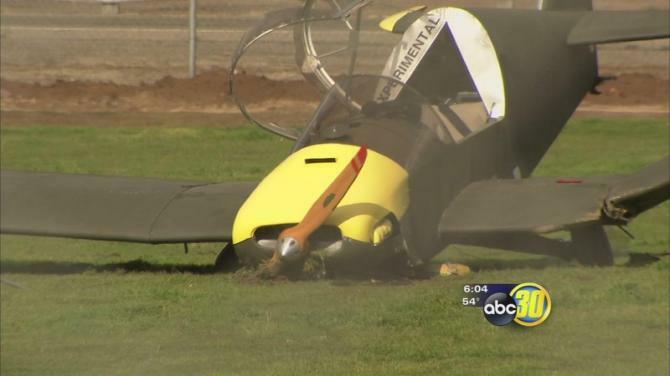 On January 10, 2016, about 1135 Pacific standard time, an experimental amateur built airplane, Moore Onex, N1950J, experienced a loss of engine power shortly after takeoff from the Fresno Chandler Executive Airport (FCH), Fresno, California. The commercial pilot, who was the sole person on board, was fatally injured. The airplane sustained substantial damage during the forced landing. The airplane was registered to and operated by the pilot as a Title 14 Code of Federal Regulations Part 91 personal flight. Visual meteorological conditions prevailed and no flight plan was filed for the local flight. The pilot received serious injuries during the accident and succumbed to his injures several days after the accident. At 11:24, airport security camera video showed the accident airplane taxi to the run-up area to prepare for its initial flight test. At 11:34, the video showed the airplane depart from runway 29 and climb out normally through about 200 feet above ground level (agl). Another video from a witness, who was located near the taxiway, depicts the engine failure. The video audio echoed a smooth and complete engine shutdown that occurred in about 1.5 seconds. According to the pilot, shortly after the engine failure, he initiated a descending, left turn, in order to avoid an airport fence. Multiple witnesses, located at the airport, observed the airplane enter a steep left bank and rapidly descending as it pitched down. Subsequently, the airplane impacted terrain in a nose down, left wing low attitude. The accident airplane was equipped with a Garmin GPS 296, which revealed the airplane's flight path. The data revealed that the accident flight was about 46 seconds in duration. During the last 13 seconds of recorded data, the airplane was initially at an airspeed of 72 knots. The data then showed a continuous and rapid loss of airspeed. Additionally, the data showed the airplane starting to descend at that time. About the last 7 seconds of recorded data, the airplane made a left turn off the runway centerline that continued to the accident site. The data stopped recording at 11:35. A disassembly was accomplished of the experimental engine. During the teardown examination, about 24 ounces of oil drained from the sump and internal portions of the engine. The oil screen was examined and was clear of metal contamination. The engine was disassembled and the center main bearing was galled, but was not seized, to the crankshaft journal. The force one main bearing was observed to be seized to the crankshaft. According to the Airframe & Powerplant mechanic and the Federal Aviation Administration (FAA) inspector, during the assembly of the engine, improper indexing of the Force One Main Bearing to the crankcase resulted in a complete misalignment of the oil passages. This misalignment blocked the oil transfer hole to the bearing, near the bearing retention dowel pin, thus preventing oil flow into the bearing. Circular impressions were observed on the force one main bearing crankshaft surface and on the crankcase bearing support, which would be consistent with the misalignment, where the oil feed hole was inadvertently used as the dowel pin hole. In the airplane engine assembly manual, it states: "First, check the fit of the Force One Main Bearing. Take one dowel pin and place it in the engine case bearing dowel pin hole. You have to place the dowel pin at the end of a drill and use a file to remove several thousandths from it's diameter to get it to fully seat in the dowel pin hole. When the dowel pin is installed, place the bearing in position, lining up the dowel pin hole in the bearing with the dowel pin in the engine case. Make sure the bearing is not held from seating fully in the case by a down pin that is too "high" by completing a visual check." Following this passage, the manual states: "Be careful not to mistake the oil feed hole for the dowel pin hole!" On January 10, 2016, about 1130 Pacific standard time, an experimental amateur built, Moore Onex, N1950J, reported a loss of engine power shortly after takeoff from the Fresno Chandler Executive Airport (FCH), Fresno, California. The airplane sustained substantial damage during the forced landing. The airplane was registered to and operated by the pilot under the provisions of Title 14 Code of Federal Regulations Part 91. The commercial pilot was the sole person on board and was seriously injured. Visual meteorological conditions prevailed and no flight plan was filed for the local personal flight. A witness located near the runway, reported that shortly after takeoff, the accident airplane lost engine power and began to descend rapidly and the left wing impacted terrain. The airplane was secured and recovered to a local storage facility for further examination.